Collecting requirements for a project is a complicated process. If you don’t do it right, you can waste both money and time. Customers who start working with software development company often have problems with specifying their needs. To avoid communication failure when getting on a project – no matter if you are a customer or a contractor – learn how to use Gherkin to collect the requirements! 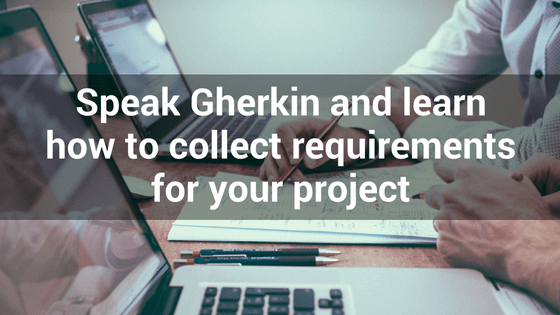 To make the process of collecting requirements easier and to meet all the presented criteria, we can use the Gherkin language. It is a natural language which can be useful both to business analysts collecting the requirements and to developers creating the scenarios for functional tests. The record of requirements in Gherkin is unambiguous, explicit, and – what’s most important – easy to understand for all the parties involved. Because of that, the discussion about the requirements is actually possible. The requirements collected in Gherkin are saved to a .feature file. Thanks to that, the developers can easily use these files for writing automated tests in BDD (Behavior-driven development) using Cucumber. When we want to create a new requirements description, we need to define the Feature which gives us the name of a new functionality. Then, we go ahead with writing the Scenario. It’s worth to mention that one file can contain more than one scenario. Each scenario consists of three main steps: Given, When, and Then. The description following the word Given sets the preconditions, When defines the actions that take place at the particular functionality and Then describes the expected outcome of the action. In the example presented above, there is one more keyword: And which continues the method that it follows. Therefore, when listed after When, it would continue this section and define another action. Gherkin knows one more keyword: But – but, to be honest, in my whole career as a Project Manager, I have never found a situation when it could be applied. Of course, in agile projects, the requirements are changing. It is necessary to apply changes in the .feature files and therefore – the on-going changes in application tests. This way we can keep our documentation up-to-date. Completing the tasks in compliance with the scenarios results in delivering up and running elements that perfectly fit with the principles of the Agile management.